According to new research from IDC that reveals how Salesforce and its ecosystem of customers and partners will drive wider market revenue, in Australia, the “Salesforce Economy" will drive more than 79,000 new direct and indirect jobs by 2022. It says the cloud and software giant will also add $29 billion to GDP in Australia by 2022. In 2016 Salesforce’s customer ecosystem made $3.2 for every dollar Salesforce made in Australia and by 2022, for every dollar Salesforce makes in Australia, the Salesforce ecosystem will gain $5.3. Salesforce says the Australian stats are in line with the global trend of cloud computing currently growing at a much faster pace than IT as a whole. Annual growth is forecast at 17%, anchoring investments in products and services supporting digital transformation projects that will reach $2 trillion by 2022. The research is released alongside the new Salesforce AppExchange, also announced today. Want more? See the study here. What word proceeds blocker, fraud, exchange, network and server? And do you know your DAM and your CX from your PII to MRM? Or your black lists from white or even your RTB and PMP? Fear not as Adobe is at the rescue when it comes to navigating the the ad tech and mar tech landscapes. 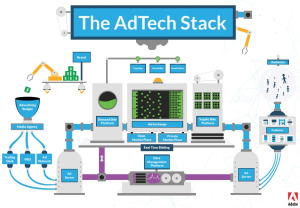 Adobe’s 'AdTech and MarTech Glossary' is designed to arm marketers with key information on the ad tech and martech landscape, along with the potential integration points, “so they can deliver the best possible experiences to their customers”. Check it out here. Ad tech vs martech - is there a winner?